Swimming toward the whale shark. “Jump, jump!” our boat driver shouts. I spring myself from the ledge of the small motor-boat that is transporting us through the open waters off the coast of Cancun, Mexico. Ahead of me is my target. 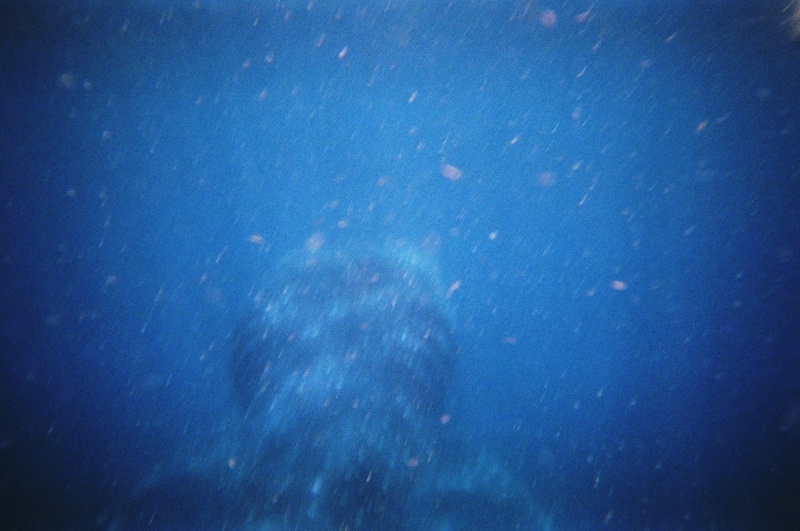 I hit the water with Tom at my side and begin swimming toward the large 15-foot whale shark before me. 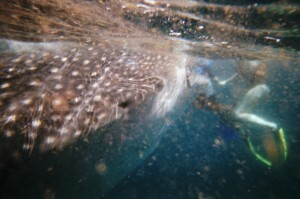 The elusive whale shark – up close and personal. At first Tom and I thought we were going in with those other three people on our boat which we were surprised about since standard regulations says only two people from each boat can go in at a time and be swimming with whale sharks from each boat. We were the only boat by this particular whale shark, which is why three people got to jump in with the swim guide. The driver, however, told us to wait. He then maneuvered the boat so we were in front of another whale shark coming toward us from the opposite side – and that’s when we were instructed to jump. Hitting the water without our swim guide was a bit strange. I keep waiting for instructions, but none come. However, this is our third time and Tom and I know what to do. 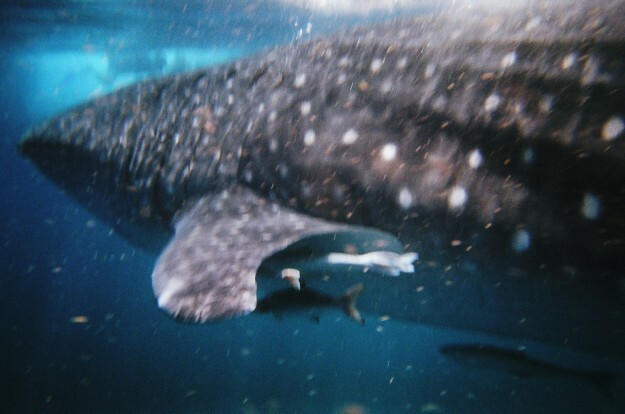 We swim fast and powerfully against the bobbing waves until we are up next to the whale shark. By this time, other boats have spotted the whale shark so we aren’t alone in the water, but it doesn’t matter. She is long enough for eight of us to easily swim alongside her. Swimming alongside the whale shark and a few remora fish. Tom and I quickly lose each other as we fight to stay alongside her spotted skin. She moves gracefully in the water, her wide head searching for plankton. Her body gets narrower as it stretches behind her. A shark like fin rests on top of her long flat body and her long tail is swishing smoothly at her end, reminding me of how she got her name despite not being a whale or what one typically think of for a shark. She is one of a species of fish that is the largest fish in the sea, hence the whale part of their name, and due to their fin on top and large mouth, they were also bestowed with the moniker of “shark”. Big fin and tail, but NOT a shark. Thank goodness. Despite the large size and mouth of these creatures, I’m not scared; not like the first time I jumped in with them – a combination of excitement and trepidation. Our guides insisted they have never accidentally eaten anyone, but when you’re swimming toward it and see it surface, opening its two meter wide mouth, it’s hard not to wonder if you’re about to be the next Pinocchio swallowed alive by the big whale. Big mouth getting ready eat some plankton. And hopefully not that arm. Feeling braver, I dive underneath the two life-jacket clad people in front of me, in an effort to move from the whale shark’s tail toward the front of her. Unlike the first two times when the whale shark moved faster than I could swim and was hard to keep up with, this whale shark is moving very slowly. Tom and I rented wetsuits in order to be more mobile and it was well worth the ten dollars (we didn’t have to wear life jackets if we had on wetsuits). While everyone else is bobbing on the surface, I hold my breath a few feet under the water and swim right alongside her. I’m so close I could reach over and touch right underneath her fin – but I don’t as we were instructed not to touch the whale sharks. I still have my snorkel mouthpiece in, but my mouth is widening into a smile around it. This is truly one of the most amazing experiences of my life and I’m in the moment enough to be truly aware of this fact. Each of my senses seems heightened. It’s just the whale shark and me in the wide blue water. I make a large stroke with my arms to keep myself down under the water and alongside her. My lungs are starting to hurt but I don’t care. I am mimicking every move of her body and turn as she turns, speed up as she speeds up. Without hearing everyone else swimming with the whale sharks splashing around above me, it’s peaceful and I wish I were scuba diving so I could stay down here longer. I’m almost next to her head, I just need a few more strokes…but I can’t do it. My lungs are screaming at me to ascend into the air and with a few kicks I rise to the surface. Right under three snorkelers. Shoot, should have looked up before surfacing. I shove my way through their bodies and take a huge breath as soon as I am in the air again. “I’m sorry. Sorry!” I apologize profusely as I continue to bump against them. 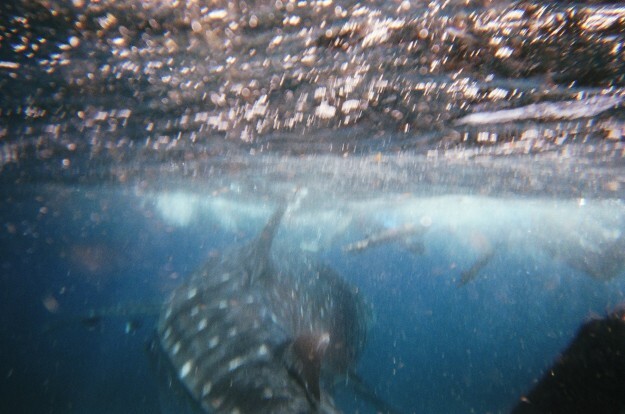 They don’t even look up, their eyes firmly looking under water at my whale shark as she swims away from us. Tom is suddenly in front of me, grinning from ear to ear. I grin back. We’re both breathing heavily so words aren’t necessary. We’re both well aware how awesome this is. Getting ready for round 2 of swimming with the whale shark. “Do we have to go back?” I ask, swiveling my head to look for our boat, which is hard to spot among the dozens and dozens bobbing about in this part of the ocean, all searching for the whale sharks. (I counted when we first arrived – there were over 50). Tom spots the boat. “They’re not gesturing at us.” We both turn to look in the whale shark’s direction. She is still nearby. “Let’s go,” I say excitedly and we both begin swimming toward her. I put my head underneath the water and see her tail. I swim faster to catch up with her, but immediately realize I don’t need to. She is starting to turn. Right toward me. Last time this happened, I immediately freaked out and moved to the side. Not this time. This time, during this possibly once in a lifetime experience, I’m going to be brave. I dive down, once again glad that I am wearing a wetsuit instead of a lifejacket so I have this option, and then I just stay down, floating as the large, beautiful beast gets closer. Once again I just feel like it’s her and me down here in the open blue. Her mouth is already partially open and she begins to open it wider. I’m directly in front of her and she is only about 10-12 feet away from me. Her mouth looks to be almost as wide as I am long. I stare into its depths, mesmerized. I see some white strands stringing between her jaws and as she opens it even wider I’m assuming there must be some plankton floating around here that she’s found. Which I also must be right in the midst of. Still, I’m not scared. This is too cool to be scared! Plus, our guides back on the boat told us whale sharks will always turn before running into a person and that the whale sharks don’t want to eat us accidentally any more than we want them not to eat us. 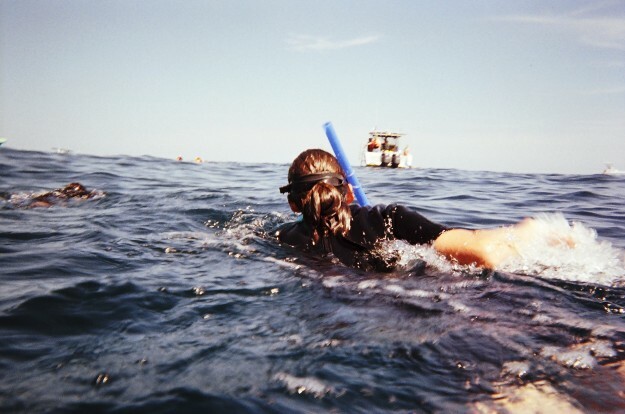 She gets a little closer and I am literally staring into her mouth, soaking up the view as I know she’s going to turn at any second – she’s got to be only about 7-8 feet away at this point – and wish I had our underwater disposable camera instead of Tom. She’s continuing to glide toward me, her mouth a horizontally elongated “O”, like she’s trying to learn how to whistle. Wait. Why isn’t she turning? Shouldn’t she be wanting to turn away from me by now? Stay calm, I tell myself. She’s going to turn. She’s not going to eat you. For once in your life, be brave. When else are you going to stare into an enormous sea creature’s mouth? Before I even realize what I’m doing, I’ve surfaced with a scream and am swimming away as fast as I can. My adrenaline is going so fast and I’m sure Miss Whale Shark can hear my heart beating underneath the water and that I’m going to be gobbled up at any second. But I’m not. And when I turn around, she’s gliding away parallel to me, probably having turned right when I screamed. Ah, well. Guess I can’t blame my instinct for trying to keep me alive. Hope my new whale shark friend got a chuckle out of my dramatic scream. The whale shark swimming away into the depths of the ocean. Wow! Great photos. I had no idea whale sharks came around Mexico. I’m so jealous! You are one lucky gal. Thanks Melissa! We were really lucky since they migrate through Mexico and aren’t there for too long, but just happened to be there when we were visiting. How very cool! 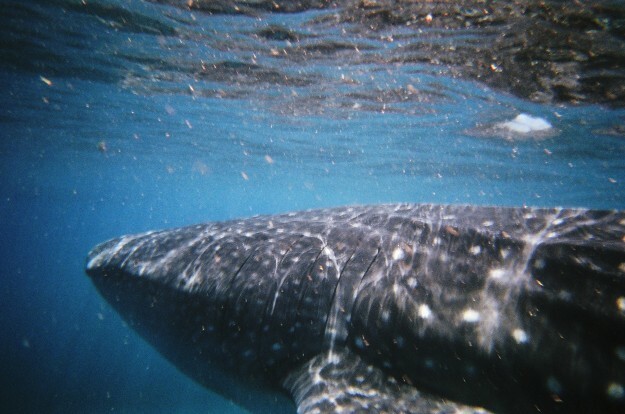 Glad you weren’t gobbled up by a whale shark. I had no idea that they weren’t whales or that they migrate through Mexico. We were there in the middle of July. 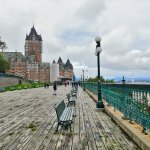 Definitely go if you ever get the chance – it’s such an incredible experience!